-Read the excerpt below from BusinessandMediaInstitute.org. America is racing toward the Jan. 1 fiscal cliff deadline when tax hikes and spending cuts automatically take effect. But the overwhelming news focus has been only on tax hikes as a solution to the problem. Since the election, ABC News has talked about raising taxes more than 17 times more than spending cuts. 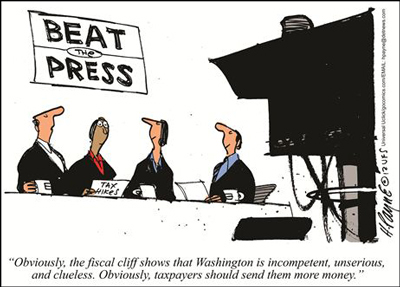 …The Media Research Center’s Business and Media Institute analyzed evening news coverage of the budget battle and found both NBC and CBS also discussed taxes far more than spending – spinning the Capitol Hill battle into one where the liberal agenda of increased spending dominated. Overall, the networks focused more than twice as much on tax increases as they did on spending cuts (29 minutes 31 seconds to 12 minutes 54 seconds). Much of the media focus has been on an Americans for Tax Reform pledge many congressmen have signed promising not to not raise taxes. Media outlets repeatedly harped on that being a problem and highlighted anyone willing to renege on it. ABC devoted more than 10 minutes to talk of taxes and just 35 seconds to spending cuts (10 minutes 18 seconds to 35 seconds) in the first three weeks after the presidential election. Senior Political Correspondent Jonathan Karl pointed at the pledge as being a potential cause for the fiscal cliff. “The pledge is the biggest obstacle to any deal that would raise taxes,” he told “World News” viewers Nov. 26. Reporters repeatedly asked Republican congressmen if they would vote to raise taxes. Most stories did not ask if Democrats were also willing to cut spending. On Nov. 13, Karl badgered Rep. Paul Ryan, R-Wisc., with three questions in a row whether he would support “a plan that raises tax rates on the top 2 percent,” even though he said no the first time. NBC “Nightly News” discussed tax increases more than twice as often as spending cuts (4 minutes 23 seconds to 1 minute 47 seconds.) And Chief White House correspondent Chuck Todd proceeded to blame Republicans for not agreeing to a hike. “Despite all the happy talk from some Senate Republicans about the potential for compromising on taxes, the real action is between those House Republicans, elected by more conservative electorate and the White House,” he explained on Nov. 26. CBS covered taxes by more than three minutes more (14 minutes 5 seconds to 10 minutes 12 seconds). But that total also took into account that more than a third of the CBS spending cut total came from one story detailing the horrific downside of spending cuts. That Nov. 11 “Evening News” story had national security correspondent David Martin referring to the cliff as a potential “disaster” to the American military. Even when networks discussed what the cliff would mean, they often compared the actions of both sides as talking tax cuts. Washington Correspondent Wyatt Andrews did just that on a Nov. 21 “Evening News” story about the fiscal cliff. “Their biggest idea was to increase revenue by combining both the president’s demand for higher taxes on the rich and the Republican proposal to get rid of tax loopholes,” he said of the proposed Simpson-Bowles tax plan that was designed as a compromise to solve the budget crisis. But both those ideas are just different phrasings for raising taxes. The Business and Media Institute analyzed evening news shows from Nov. 7 through Nov. 26 for stories about the “fiscal cliff,” “budget,” “tax” or “spending.” Statements about both were then timed and tallied. 1. Which two types of media bias does the Business and Media Institute’s study highlight? 2. In his report, Dan Gainor states: “It’s interesting that spending cuts received so little coverage since even President Obama admitted that entitlement spending is the top problem causing deficits.” Why do you think ABC (and to a lesser extent NBC and CBS) chose to focus on tax increases, and ignore the need for the government to implement spending cuts? 3. How do you think the media’s practice of focusing on one side of an issue (while ignoring the other) affects the average news consumer’s point of view on an issue? 1. The study highlights bias by story selection and omission. 3. If the media only focuses on one side of an issue (in this instance, the liberal point of view: that the only way to avoid extreme fiscal problems is to raise taxes) the average news consumer could be led to believe that it is the only solution available – the only correct, or possible solution. Every issue has two sides, or two opinions. The job of the media is to report both sides to best inform viewers, and let them come to their own conclusion about which they think would be best for our country. Reporting only one side leads unaware citizens to think the side reported on is the only possible solution.